Enjoy comfort and convenience as you ensconce yourself in a second row North Myrtle Beach resort. A Place at the Beach V is in the beautiful Shore Drive area of the city and sits just across the street from a stunning South Carolina beach. Offering excellent options for beach vacation rentals A Place at the Beach V will be an excellent choice for a family beach retreat in one of the most popular vacation destinations in the United States. Offering comfortable, cozy condominiums, A Place at the Beach V is a perfect vacation destination for those who want to bring the family so they can get out and enjoy this beautiful and exciting area. Nestled in the very popular Shore Drive area of North Myrtle Beach and sitting just a short walk from the shore, this resort offers more than just your home away from home as it also is in a superior location for the family who wants to not only fill days with beach activities but also explore the many attractions and activities that the Grand Strand boasts. 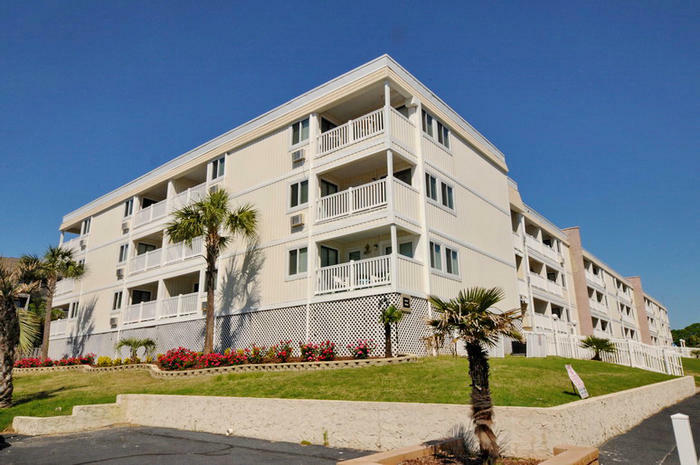 The charming condominiums that A Place at the Beach V offers can comfortably accommodate families during their North Myrtle Beach vacations. Comfortably furnished these condos boast private balconies that deliver ocean views. These vacation rentals provide guests all of the creature comforts of home to enhance comfort and convenience during their beach retreat. As compared to what you will find when spending your vacation in a hotel the rentals offered by A Place at the Beach V will make you feel as if you have stepped into your second home. From location to amenities A Place at the Beach V was designed to help vacationers make the most of their time in North Myrtle Beach. As this resort sits across the street from the shoreline guests will find the environment is a bit more serene than a crowded oceanfront location. This three-story resort provides ease of access to the shoreline as well as access to water amenities. A Place at the Beach V offers guests access to multiple swimming pools and sun decks with lounge chairs where guests can soak up warm rays of South Carolina sunshine. With the excellent location and wonderful amenities that this outstanding resort provides, vacationers will be sure to enjoy every moment of a vacation spent on A Place at the Beach V.